What size filter goes on my 2018 6.0 Response TXi? It has a Mobile M1-301A on it now from the dealer when they did the 20 hour service, wanting to put the best WIX filter on it when I change the oil at 70 hrs. The M1-301A does not bring up anything when I do a search on the WIX site. I was planning to put Mobile 1 15W-40 back in it but see the dealer used Mobile Delvac but don't see the weight they used? Suggestions? From what I have now found it looks like I need the WIX 51515XP oil filter. When the dealer did my 20 hr service they noted they used 5W-40 Mobil Delvac Synthetic but I just called them and they said what they actually used was probably conventional 15W-40. Now I'm not sure what oil to use??? I use a M1-301, but have read that the FL-1A is supposed to be a very good filter as well. For oil I'm using Amsoil 15W-40 Heavy Duty Diesel and Marine. I was viewing the Malibu brochure after I posted. Didn't realize they were running PCM engines on the Responses. 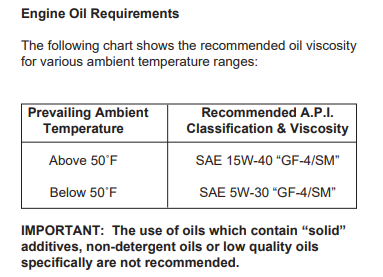 I read somewhere that 15W-40 Conventional oil is equal to 5W-40 Full Synthetic. I think it was on the Rotella website. I had a hard time finding 15W-40 Full Synthetic. Has anyone else heard that? The Rotella comes in FULL synthetic in the T6, in a 5W-40 not the 15w-40 (T5) blended unfortunately. @scotchipman: The Wix application chart notes the filter you tag fits Chrysler and Mazda, so simply verify it is what you want (I am not sure if you have a standard filter or a remote mount that may take a different filter, it is simply all about the thread pitch and gasket diameter as far as fitting goes). What ever filter, I like to get the larger version, simply use the specs in the filter selection menu and cross reference it, Wix is a very good filter (there are basically 2/3 versions across all the brands) . From an application for vehicles, use a pickup truck as your guide, they tend to put the bigger filters on them compared to a car which tends to have size limitations. The reality is not that big a deal since we as a group tend to change the oil and filter at a pretty high frequency or very low 'miles' in car terms and we run in a very clean environment. As for oil, don't sweat the dino oil in your boat now, it will help break in the rings anyway. At you next swap, I would recommend going synthetic and use the weight suggestion in the manual. It does kind of depend on your use. What I mean by that is really how cold / warm you operate the boat, for those of us in the northern climes that will persevere until the water is solid, a lower viscosity oil for start up is not a bad idea, if you run in very hot conditions, low viz is not a big issue. In reality, this topic tends to be overthought as there are many excellent options out there. More good info on the bob the oil guy website.